The way Shewag insulted the Lankan bowlers, any pacer would feel humiliated, and the icing on the cake was when Shewag demolished Muralidharan with his "Go-Attack-Kill" attitude, and it seriously demoralized Murali and would have had similar nightmares of what Warne had on Sachin Tendulkar. Moment Shewag started his assault on the Lankan bowlers; defeat was on the cards for the Lankans. The pitch was an absolute beauty which did not relent even till the last day. I was so happy to see Muralidharan taking most of the Indian wickets as the pitch offered some support for the spinners, and that was a good indication for Dhoni to deploy Harbajan and Ojha to rip off the Lankan batting order, but the surprise came from Zaheer as he scalped 5 wickets and left the Lankans at bay, and the pitch all of a sudden became a pacer paradise. On the whole it was a wonderful effort by Dhoni and his men to reach the top spot and come out as the number 1 team in the world in the test cricket arena. It is not an easy joke to maintain a winning streak since 2008 and having the record of not losing even a single game out of the last 14 tests, we are now in the race to beat Australia's record of having 16 consecutive test wins. Also a point to be noted in this series is, this is the first time INDIA has beaten its opponents by two consecutive innings defeat and clinching the series. 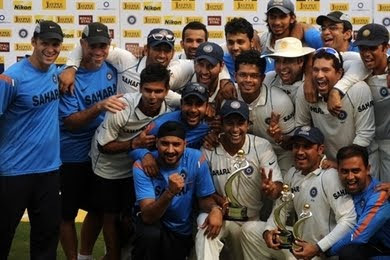 Well done boys and you guys have really made every INDIAN proud today. Today is a proud day for every cricket fanatic like me.